The following is a list of our most common ink jet parts and supplies. They are compatible with Codeck, Digital Design, control Print, Marsh, Diagraph, Foxjet and many other ink jet manufacturers. If you do not see the part you need here, please contact us as we carry other items not listed here. 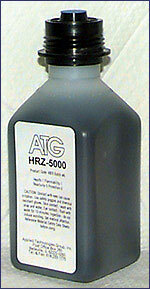 MSC - 01 Array plate "o-ring"
MSC - 02 Manifold "o-ring"
HRZ-5000 is a high quality oil-based ink jet ink. It has been carefully formulated and processed by research personnel with many years of experience and is designed to be compatible with the black ink used by most high resolution ink jet systems installed in the packaging industry. This high performance ink formulation is comparable to the following inks: Marsh BC-77 Ink, Diagraph Pel Series V-300 Ink, Foxjet Versaprint V-300 Black Ink, ITI V-300 Ink, Willett VP Bar Code V-300 Ink, Matthews IP9000 V-300 Ink, and many more! ATG is not affiliated with any of the above equipment manufacturers or their subsidiaries. The names listed are trademarks of their manufacturers, which have not manufactured, sponsored or approved this product.